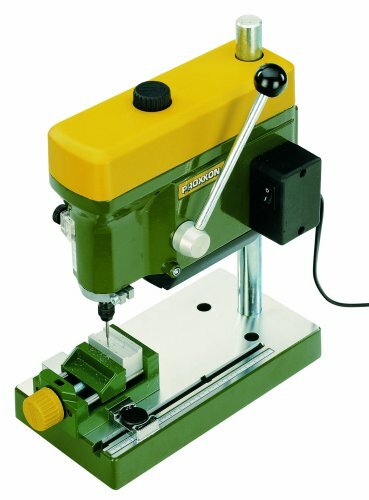 A mini drill press may be the best bet for you if you intend to work with small objects like circuitry or jewellery. 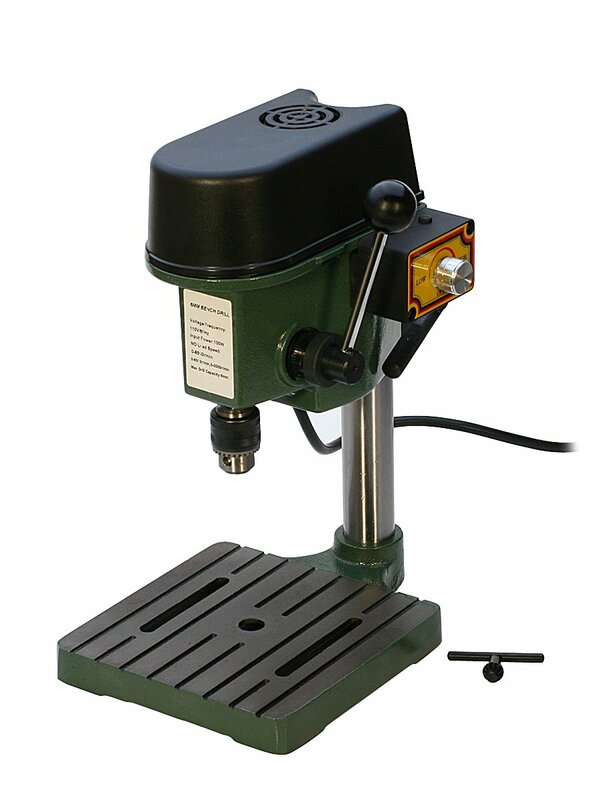 A notable advantage of the mini drill press is that it’s very compact and highly portable. This is because the drilling surface/table is the same part of the machine as the supportive base area. For bigger jobs a small drill press probably isn’t suitable. However, they do have considerable design features worth noting for their various specific use cases. Portable – Because of this machines compact design you could actually use it anywhere from your kitchen to your office. Lugging it around isn’t difficult at all, so moving it from place to place or traveling with a small drill press is completely manageable. Limited drilling ability for large objects – Obviously the compact size means that there will be much more limitations on how big of an object you can drill into. which is because of the much smaller throat capacity. So if you go for the mini drill option make sure that it fits the scope of your project. Drilling with this machine offers you a very high degree of precision and accuracy. Because it’s priced affordably, yet is built to high quality standards this is a pretty great option. The work table is a solid high quality cast iron design. It has a throat capacity of 4 inches, and allows drill bits from 0.79 to 6mm, and only weighs a meager 12.1 lbs. Although TruePower is currently a relatively unknown brand, consumers agree that its products rival the quality of much more well known brands. They certainly are priced well too. The DRL-300 small drill press is a versatile high quality machine that’s ideal for both the hobbyist or Pro. The DRL-300.00 weighs in at only 12.2 lbs and should be suitable for just about any space you’d like to work in. This offers you great durability, and decent bang for your buck. EuroTool is a well-known and reputable manufacturer. They have a great reputation in the DIY community so you can trust this products quality. Worth noting is that it has variable speed settings up to 8,500 RPM. Overall I think this a great choice. This model goes above and beyond what most people expect out of a small drill for this price. It’s built robustly, using highly quality materials and is nice and smooth to operate. Great for Jewelery or arts and craft in general this is a favorite among hobbyists and pro jewelers alike. It has a 4 inch throat capacity, and It has a compact size and weight of about 12.3lb, so its as portable as any. What reviewers love about this is that it’s so easy to pick up and use all the features right away without being an expert. Overall this machine is a fantastic affordable workhorse, and a decent choice. 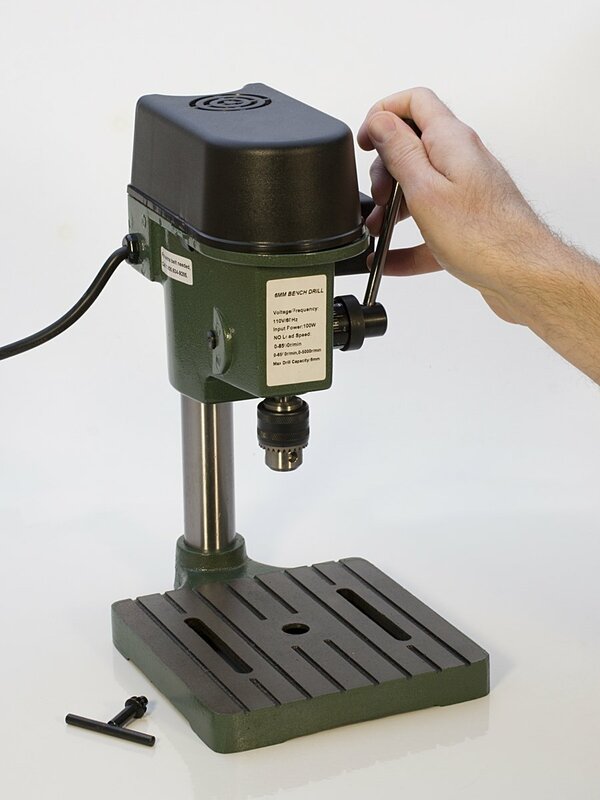 The Proxxon TBM mini drill press is perfect for when you need a tiny machine to drill accurate and precise holes. This particular machine can easily drill as small as 0.5 millimeters, meaning you can even use this tool for jewellery and other high precision jobs. The work surface/table is high quality cast alloy, so it is strong and durable. The table size is 8.5 inches by 4.75 inches, the perfect size for this type of product. The column is crafted using chrome steel and is 4/5 of an inch in size. Three different speed settings are available on this drill: 1,800 RPM, 4700 RPM, and a whopping 8500 RPM for when high speed is required. This is a handy feature as depending on the material you’re drilling you might want high speed / low or torque, or perhaps high torque and lower speed. All in all, the Proxxon 38128 TBM is a good choice, the only problem is its price. It’s quite pricey compared to the other options. What factors should I consider before purchasing? How often will it be used/ does it need to be a very durable model? Will the smaller size be powerful/large enough for my project? Will it be used for amateur level DIY or serious use? Does the chuck hold big enough drills for the holes you want to drill? A small/miniature drill press is a great versatile tool that will fit just about anywhere. As I have mentioned, it is suitable for work on smaller objects mostly. For hobbies/projects like jewellery etc they’re perfect. But if you want to work on larger projects you might need something bigger and more powerful. If you decide to go ahead and purchase one then you’ll surely be very impressed by how portable they are. 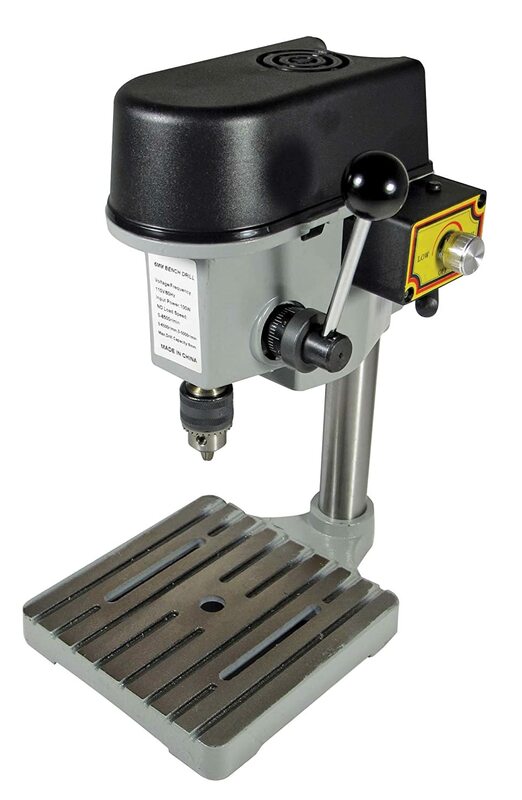 In summary mini drill presses are a fantastic option for a particular niche of drill press users. If you know that it’s what you need for the type of projects you’re doing go ahead and give it a shot.